I've always been curious about New England Style Hot Dog Buns. What makes them unique is that they stand up straight and are filled from the top, and the sides are buttered and grilled. These New England hot dog buns are also famously used for lobster rolls and other seafood salad sandwiches. The buns are baked in one continuous flat loaf, and then cut into buns and split on the top. To prepare them for serving, you butter the split sides and grill them in a pan like the bread for grilled cheese. This dough for New England hot dog buns is enriched with milk, sugar or non-diastatic malt powder, butter, and an egg. 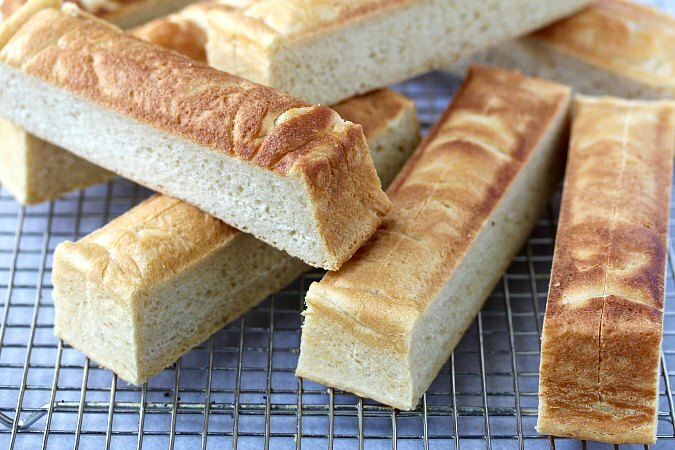 It has an almost brioche-like flavor and texture. The buns were wonderful served with beef hot dogs adorned only with mustard, pickles, and onions. To make these buns, I purchased this USA Pans New England Hot Dog Pan. 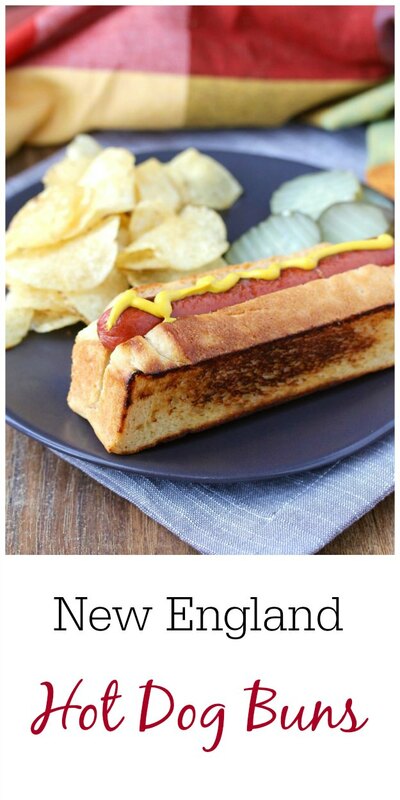 I was looking for an excuse to get the pan, so when Christie of A Kitchen Hoors' Adventure rounded up a few of us to post hot dog recipes, it was all I needed to "justify" getting one. If you don't want to get the pan, all you need to do is rig up a pan, or combination of pans, to create the equivalent of a 15 by 6 by 1 1/2 inch pan to make these. I think that you could do it with disposable foil pans actually. There are so many shapes and sizes available, and they are bendy enough to customize for these buns. This was the first time I've worked with this dough, and I probably could have better smoothed out the dough before loading it into the pan. Regardless, the resulting buns were delicious. These buns were delicious on the day I made them. To keep any leftovers, wrap them individually in plastic wrap, and place them in the freezer in a freezer bag for up to two months. 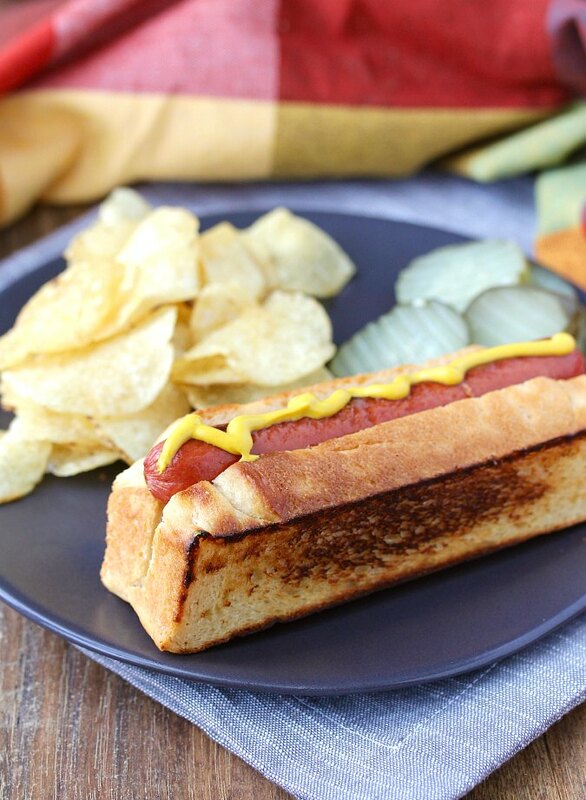 After the recipe for the buns, you will find delicious hot dog recipes to fill these buns! Add all of the ingredients to the bowl of a stand mixer and mix with the dough hook for about 5 minutes, until you have a smooth dough. Cover the bowl with plastic wrap and let rise until doubled, about 1 to 2 hours. Spray your pan with spray oil, or lightly grease with softened butter. Remove the dough from the bowl and stretch it out to about 15 by 6 inches and place it in the pan. Continue to stretch the dough to fit the pan. If it resists, cover it and let it rest for about 10 minutes, and then stretch and pat the dough to fit the pan. Cover the dough with oiled plastic wrap. Preheat your oven to 375 degrees F. Let the dough rise for 45 to 60 minutes, until it reaches about 1/2 inch below the top of the pan. When the dough is ready, remove the plastic wrap. 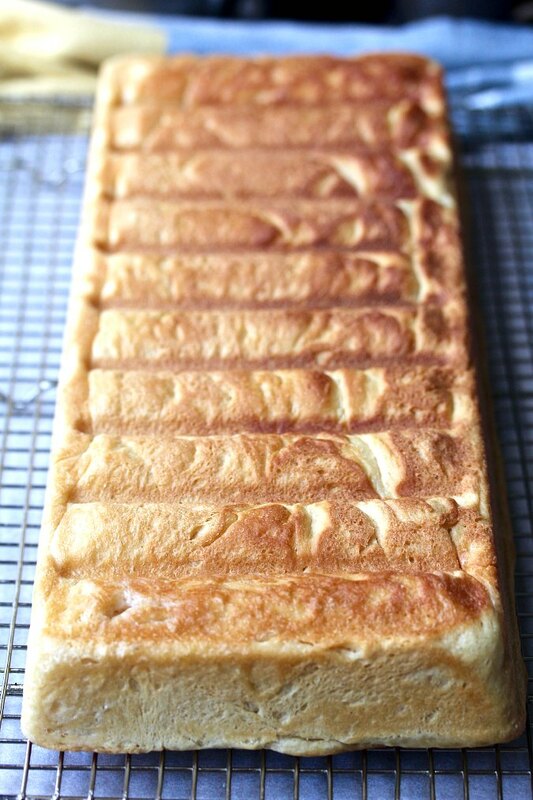 Spray a baking sheet with spray oil, and place it on top of the risen dough. Place the pan in the oven and place a cast iron pan on top of the baking sheet to weigh it down. Close the oven door and bake for 18 minutes. Remove the pans topping the dough and bake for another few minutes if the buns need to brown a bit more. Cool the buns in the pan for 5 minutes, and then turn the bread out onto a wire rack and cool completely. Cut into individual buns and then split the buns down the middle. 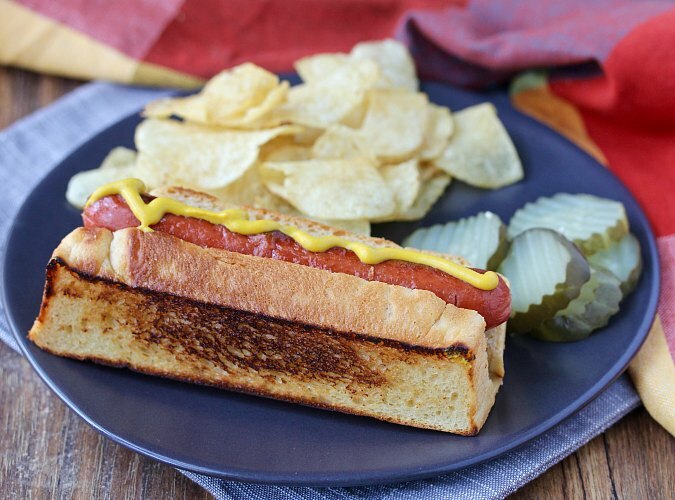 Here’s some more #HotDogDay recipes! You never cease to amaze me Karen. I have never heard of these. And how am I not surprised you managed to bring one of your beautiful breads to a hot dog party?!?! So neat. Thanks for sharing. Thanks Camilla! One of my favorite things to do is bake bread, so any chance I get I make a new (to me) bread. I was so excited to try these! Your buns turned out really nice. I bought the pan years ago, and tried making the buns once, but they didn't turn out so well. Maybe I should try it again. Thanks Karin! I read several pages of comments on the KAF website before attempting these. The trick for me was to make them as hydrated as possible. Thanks, Karen, that might help. I Denver finding them too dense. Well, I was going to say You never cease to amaze me, Karen... but then I saw Wendy's comment and had to smile! it is so true... you amaze us all, all the time! Thank you for your kind words and for the link to that recipe. I'm definitely trying it! I have not made a butterscotch pie, but I am totally intrigued. It sounds so delicious!